what is a focal point in art? The focal point of a painting is the main attraction. 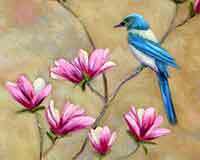 It is the main emphasis of a painting that attracts the viewer in the first place. The viewer's eye is first attracted by the painting's focal area. Then it moves on to other areas of the painting. how do you create a focal point? There are a number of different tools the artist can use to attract the eye of the viewer. Accomplished artists use one or more of the following methods to make attractive paintings. The easiest and the most valuable tool for the artist is the use of value contrast. Value is the contrast between light and dark. The eye is automatically drawn to a contrast between light and dark. The artist uses light against dark in many areas of the painting. But the strongest value contrast should be used in the focal area. The viewer is more comfortable when objects are placed together or near other objects. Elements of the painting that are placed by themselves will automatically attract attention. 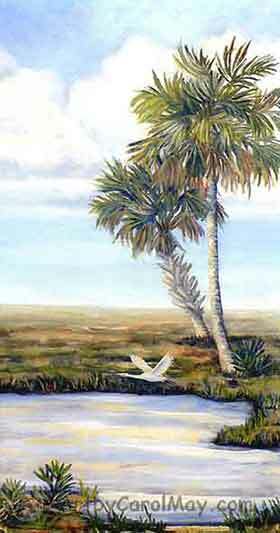 The "Lone Egret" attracts the viewer because it is all by itself. People, animals or vehicles become the star of the show when they are placed in a painting. Just be sure and give them adequate space in front of their face to head into the painting. Do not place them close to the edge of the painting, looking out. Their view would carry the viewer's eye out of the painting. 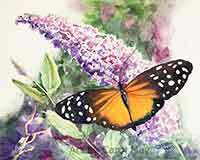 Use more detail in the focal areas compared to other areas of the painting. There is more detail on the chicken's face and on her feathers compared to the background of the painting. The background is somewhat out of focus. Soft edges are easier to look at. Hard edges attract more attention. Notice the hard edges on Lacey compared to the soft edges in the rest of the painting. Draw The Attention Of The Viewer. Brighter, more saturated color attracts attention. 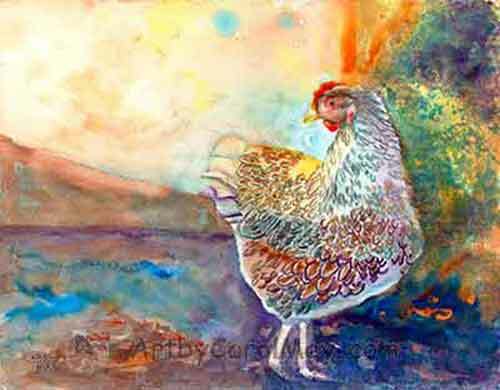 Notice the red comb and wattles on the chicken are the brightest red in the painting. The Walter Foster series of How-to Series of art books have been favorites for many years. There is still a large collection of them in my painting library that I use for reference. The series of books is still going strong with many updated art books on painting, drawing and even cartoons. 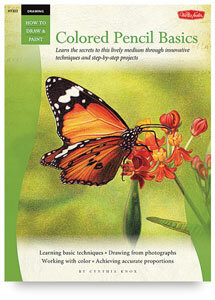 There are more than fifteen different books listed on the Blick Art Materials website. Colors directly across from each other on the color wheel are called complimentary colors. Blue and orange, red and green and yellow and violet are the complimentary colors. They vibrate when they are placed next to each other. They are great for attracting the viewer's attention to the focal area. 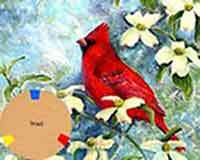 When you are selecting colors for your paintings, complimentary colors are an ideal choice. Placing warm colors against cool colors is another great tool for the artist to use in the focal point of their paintings. The warm colors, red, orange and yellow automatically attract attention. When we place them against some cool colors, they really sparkle. How to mix warm colors and cool colors. Use any or all of these tools to create the focal point of your paintings. Your paintings will be sure to attract the viewer's attention.